Flexible course hours that supplement an existing course or provide introductory training in a particular area of writing, rhetoric, or digital studies. Repeatable up to 6. Instruction and experience in writing for business, industry, and government. Emphasis on clarity, conciseness, and effectiveness in preparing letters, memos, and reports for specific audiences. Fulfills the Graduation Writing Requirement. Prereq: Completion of University Writing requirement or new general education Communications (6 hour) sequence. Instruction and experience in writing for science and technology. Emphasis on precision, clarity, and conciseness in preparing rhetorically effective letters, proposals, reports, and presentations for specific audiences. Fulfills the Graduation Writing Requirement. Prereq: Completion of Composition and Communication requirement. An open topics writing course focused on rhetorical analysis of issues of academic, political, social, or cultural significance. Students will interpret, analyze, and evaluate rhetorical strategies employed in print and digital texts. Fulfills the Graduation Writing Requirement. Repeatable up to 6 hours under different subtitles. Prereq: Completion of Composition and Communication requirement or consent of instructor. This course develops a practical understanding of writing and rhetoric through multimedia platforms and artifacts. With a focus on developing rhetorical skills for digital environments, students will produce and publish to the web in a range of media such as digital video and photography, blogs, wikis, podcasts, and comics. Prereq: Completion of Composition and Communication requirement or consent of instructor. The course examines how social media and the writing practices we employ influence notions of what it means to participate in community, society, and public discourse. Students will compose across different social media platforms and explore theoretical literature to examine the ways these tools are evolving. Prereq: Completion of Composition and Communication requirement or consent of instructor. Introductory course exploring rhetoric and current events focusing on the ways in which noteworthy local/global events are written, argued, and analyzed in public forums. Special emphasis on exploring rhetorical constructions of citizenship. Prereq: Completion of Composition and Communication requirement or consent of instructor. Instruction and practice in writing for the food and beverage industry. Emphasis on the history and culture of the craft beer industry and common practices in written and digital communication, argumentation and persuasion, narrative, and engagement with social media. Prereq: Completion of Composition and Communication requirement or consent of instructor. This course introduces students to the theory of rhetoric and composition. Students may examine the theoretical, ethical, and stylistic issues connected to writing in various rhetorical situations, including digital environments. The course forms a theoretical foundation for all other WRD courses and is required for all WRD majors. Prereq: Completion of Composition and Communication requirement or consent of instructor. Required for WRD majors. This course is designed for students who wish to improve their own writing style or the style of others. While the course may include some account of historical changes in prose style and require some stylistic analysis of literary texts, the emphasis is on editing contemporary prose, both in exercises and in the students’ own writing. Students will learn and practice principles such as economy, coordination, subordination, precision, parallelism, balance, coherence, rhythm, clarity, and grace. Prereq: Completion of Composition and Communication requirement and consent of instructor. 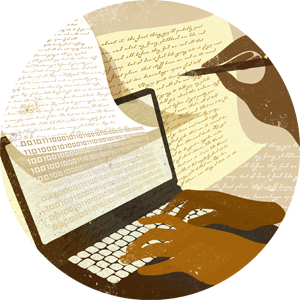 Intensive writing and reading in the genre of the essay. The course will explore the conventions of the essay and analyze historical changes in the genre. Students will write essays and analyze the stylistic choices of professional essayists in order to inform their own writing in the genre. Prereq: Completion of Composition and Communication requirement or consent of instructor. Instruction and practice with the major genres and argumentative structures of writing in the social sciences. Special emphasis on – and practice with – the written norms that shape disciplinary knowledge in social scientific fields. Prereq: Completion of Composition and Communication requirement or consent of instructor. Instruction and practice with popular audience genres and arguments in and about science, intended for both science and non-science majors. Prereq: Completion of Composition and Communication requirement or consent of instructor.Prereq: Completion of Composition and Communication requirement or consent of instructor. This course offers an introduction to and preparation for careers in the teaching of writing, professional writing, publishing, and editing. Prereq: Completion of Composition and Communication requirement or consent of instructor. This course introduces visual rhetoric, covering its history, current practice, and possible futures. Utilizing the disciplinary tools of rhetoric, students will compose in textual and visual modes, learning a variety of methods with which to create and critique visuals. Prereq: Completion of Composition and Communication requirement or consent of instructor. Instruction and practice with the major genres and structures of argumenative writing in the natural sciences. Special emphasis on and pratcie with the written norms that shape discplinary knowledge in the natural sciences. Prereq: Completion of Composition and Communication requirement or consent of instructor. This course is designed to trace the evolution of the documentary film. Although the emphasis will be on the development of the American documentary, students will also be looking into contributions from across the world. Prereq: Completion of Composition and Communication requirement or consent of instructor. This course is dedicated to critical examination of approaches to the documentary, and the construction of a documentary of one's own. Students will examine different strategies, structures, and topics, with an eye to production. Prereq: Completion of Composition and Communication requirement or consent of instructor. This course introduces students to the scholarly study of rhetoric by exploring the interrelationship of theory, criticism, and practice within a particular historical context. Prereq: Completion of Composition and Communication requirement or consent of instructor. This course examines theories of rhetorical argument. Students read rhetorical theorists who speculate about what makes certain speech persuasive, as well as contemporary rhetoricians who are actually creating persuasive written and oral texts. Students use these theories to analyze and construct original arguments. Prereq: Completion of Composition and Communication requirement or consent of instructor. An undergraduate seminar that prepares qualified undergraduate students to become engaged and effective peer consultants in the UK Writing Center. Students in the course are actively involved in reading, writing, listening, observing, speaking, researching, and presenting as they become immersed in the theory and practice of Writing Center consulting. Prereq: Completion of Composition and Communication requirement and consent of instructor. For undergraduate majors in WRD with a high standing. Each student pursues a course independently under the guidance of a faculty member and produces at least one major project. Prereq: Standing of 3.0 in the major and permission of the Director of Undergraduate Studies. This course is an internship in the community that brings together the student’s critical and practical knowledge of writing, rhetoric, or digital studies. In addition to evaluation by the internship supervisor for the course grade, the students will produce a reflective research project that may be presented in an annual public research forum. This is a capstone experience for students in the junior or senior year and is encouraged for all WRD majors. Repeatable up to 6 hours. Prereq: Completion of Composition and Communication requirement and consent of the Internship Supervisor. Studies of special topics in writing, in areas such as literary nonfiction, travel writing, science writing, responding to literature, cultural critique, and composing law and justice. Repeatable up to 6 hours under different subtitles. Prereq: Completion of Composition and Communication requirement and consent of instructor. A special topics course that examines a particular medium of autobiographical composition (textual, digital, or performative) and/or the ways autobiographical composing is used in particular contexts or communities. Students study and produce autobiographical composition. Mode of composing (print, digital, performance, or a combination) is at the discretion of the instructor. Repeatable up to 6 hours under different subtitles. Prereq: Completion of Composition and Communication requirement or consent of instructor. The course includes a broad introduction to best editing practices, as applied in literary, academic, business, and online writing. This course provides students with an introduction to the basics of editing and publishing and build upon prior knowledge of the essential elements of writing and style. Prereq: WRD 301 or WRD 306 or consent of instructor. This course addresses contemporary genres of professional writing, including professional correspondence, reports, and social media most often found in business, technical, and scientific communities. The course also addresses the common tools and technologies of professional writing production and practice. Prereq: WRD 204 or WRD 306 or consent of instructor. This course provides grounding in the analysis and theory of digital composition, which will inform personal, professional, or community-based projects. Projects will encourage students to work flexibly across various digital platforms. Prereq: WRD 308 or consent of instructor. Special topics exploring rhetoric and popular culture, with a focus on the everyday persuasion and influence generated through films, music, television, social media, and other forms of public discourse. Repeatable up to 6 hours. Prereq: Completion of Composition and Communication requirement or consent of instructor. This course explores a range of documentary approaches and styles, after which workshop and production of students’ own documentaries will be emphasized. Students will focus on particular approaches and subjects to develop their individual signatures and styles. Prereq: Completion of WRD 312 or consent of the instructor. Introduction to the written genres and argumentative structures most common to legal professions. Special emphasis on – and practice with – the rhetorical norms of research and writing in law-related contexts. Prereq: Completion of Composition and Communication. Prereq: Completion of Composition and Communication requirement or consent of instructor. This course offers a detailed examination of the history and theory of a specific rhetorical tradition or group of traditions. Students will gain familiarity with key concepts and terms in a rhetorical tradition, compare and contrast culturally situated definitions of rhetoric, and better understand the way rhetorical historiography influences how rhetorical traditions are defined and taught. Repeatable up to 6 hours under different subtitles. Prereq: Completion of WRD 320 or consent of instructor. This course examines the work that writing does in the world by connecting the study of persuasion in specific social movements, campaigns, and genres with opportunities for students to create texts and campaigns. This course may offer a historical or contemporary focus, and may examine local, regional, national, or transnational movements. Repeatable up to 6 hours under different subtitles. Prereq: Completion of WRD 320 or WRD 322 or consent of the instructor. Flexible course hours that supplement an existing course or provide advanced training in a particular area of writing, rhetoric, or digital studies. Repeatable up to 6 hours. Prereq: Completion of Composition and Communication requirement or consent of instructor. Flexible course hours that supplement an existing course or provide advanced training in a particular area of writing, rhetoric, or digital studies. When subtitled “Senior Project,” this course will provide students with the opportunity to complete a capstone project under the direction of a faculty member and with the support of peers. The three Senior Projects are 1) a senior thesis (for students going to graduate school), 2) a digital installation (presented live or online), and 3) a portfolio of work (in print or online format) suitable for employers.